The new fast casual restaurant is taking space in the forthcoming '675 N. Highland' project. Rize Artisan Pizza, a new pizza and salad concept, is slated to open its first outpost October 24, Kim Jenson-Pitts, the concept's CMO, confirmed with What Now Atlanta in a phone interview Monday. The scheduled grand opening comes with the oh-so-typical caveat of permit approvals and weather, Jenson-Pitts said. Plans for Rize Artisan Pizza were first filed with City of Atlanta in May, and the fast casual pizzeria earlier this year constructed a production facility in West Midtown. 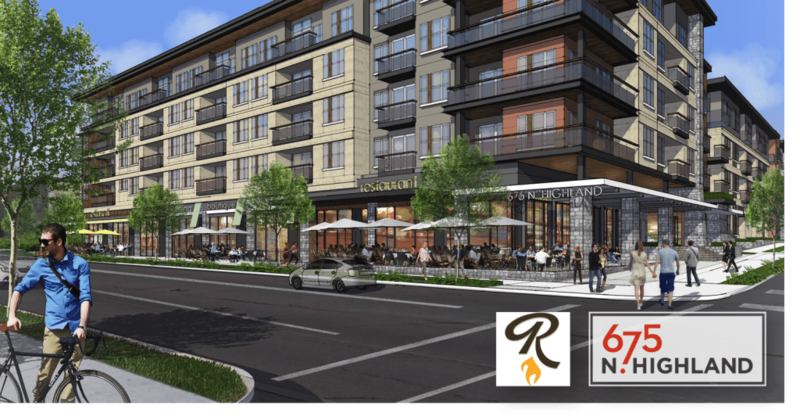 The 3,500-square-foot restaurant and 1,200-square-foot outdoor patio are currently under construction, at 675 North Highland Avenue Northeast, a soon-to-open apartment project aptly named 675 N. Highland. The "chef-driven concept" will join Trashy Diva, a woman's retailer that offers retro-inspired wears, at the development. Trashy will have two storefronts at the project, a 1,600-square-foot dress, clothing and shoes boutique and 1,500-square-foot lingerie boutique, which will include both basic staple pieces and more extravagant or niche items. Rize Artisan Pizza should open a second location in Sandy Springs, at 6050 Roswell Road in the forthcoming Square One Apartments, then up to 10 in the next year with "fast expansion after that," according to a job posting for the pizzeria. Where should Rize open its next location? Leave your thoughts in the comments! string(50) "675 North Highland Avenue NE Atlanta Georgia 30306"
Sean Davis has worked in commercial real estate for 10 years as one of the most knowledgeable professionals in the Atlanta-are multifamily industry. Sean has a Bachelors degree in Journalism and a M.B.A in Marketing and Finance.